Another poor wet summer in 2009 again showed up the short comings of many of the standard summer garden plants, Impatiens were a disaster, Petunias ended up as a soggy mess, and many other standard bedding and container plants were unable to function. 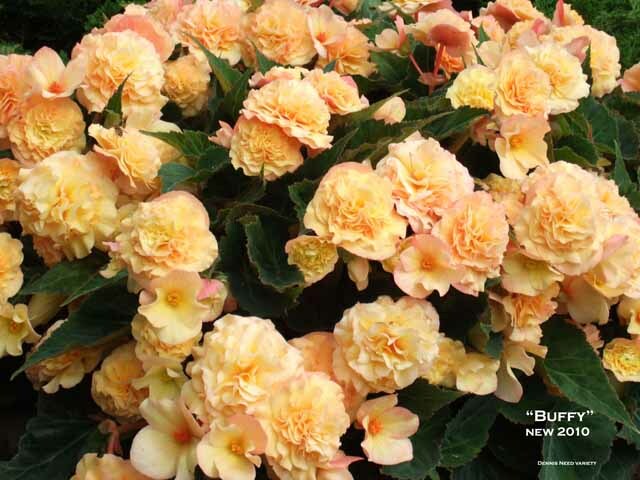 Tuberous Begonias once more showed their reliability in these dull and wet conditions. 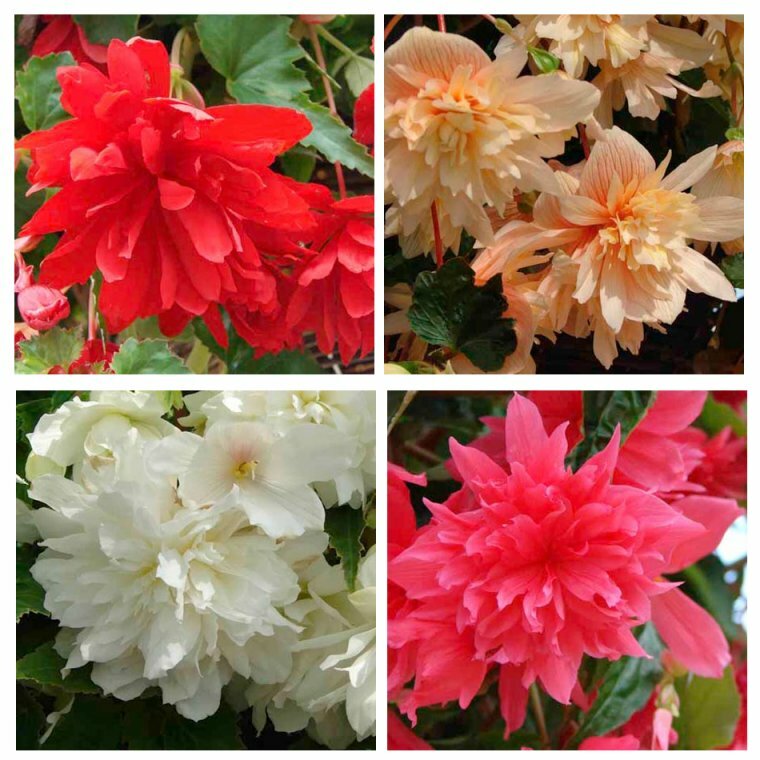 Following this I think that begonia sales for 2010 will increase considerably and with many new varieties planned for introduction this coming season, we can look forward to bright summer displays come rain or shine. Some of the new introduction for 2010 are listed below. A seedling I saw a few years back was a cross using a Begonia; pearcei hybrid in its development. This has similar shaped and marked foliage to Begonia; pearcei but was much darker with the pronounced veining similar to the species, this gives as good a foliage display as many of the small rex hybrids, the single apricot flowers making the whole plant a delight. 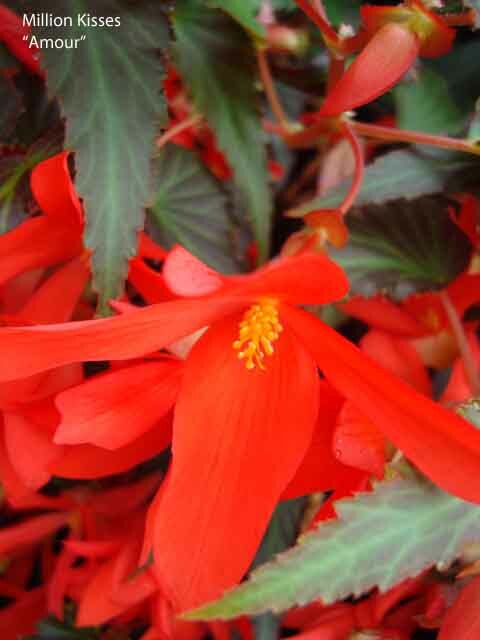 It is something that is different to many of the smaller flowered begonias. 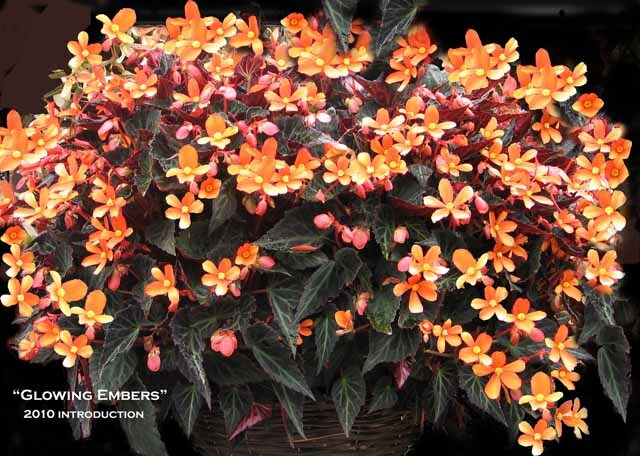 Will be available this season it has been named “Glowing Embers” and will be suitable for containers and compact baskets, it should also make good plants for bedding displays. I had some misgiving regarding its ability to stand full sun outdoors which is a problem with Begonia; pearcei, but Fred Yates the breeder has grown it in some very open sunny positions with no ill effect to the foliage. It has obviously inherited these characteristics from the other varieties in its parentage. 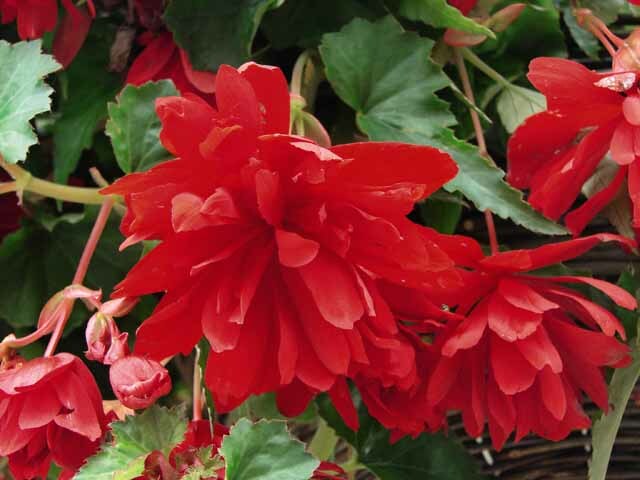 “Carmina” is another of Fred’s hybrids and will also be available around the country, this is a single dark red flower with dark foliage, its habit is different to many tuberous begonias as it continually grows additional shoots from the base of the plant. 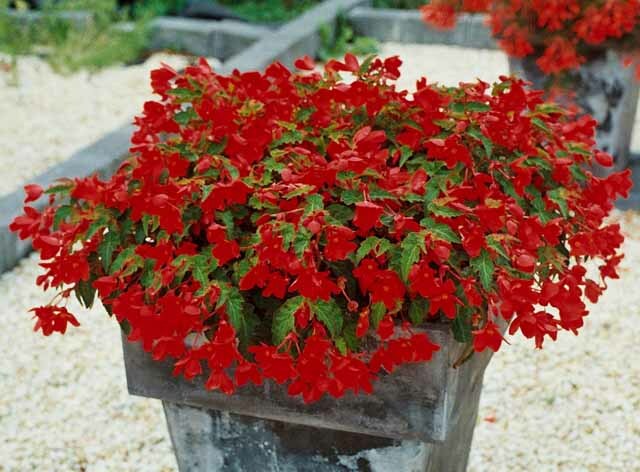 Its height is about 12 inches with a similar spread and it should be useful in many ways from bedding to container growing, and possibly baskets. I saw a large bed of this last July approximately a meter wide by about 10 meters long just covered in bloom; I believe there was also a large bed grown at Wisley. 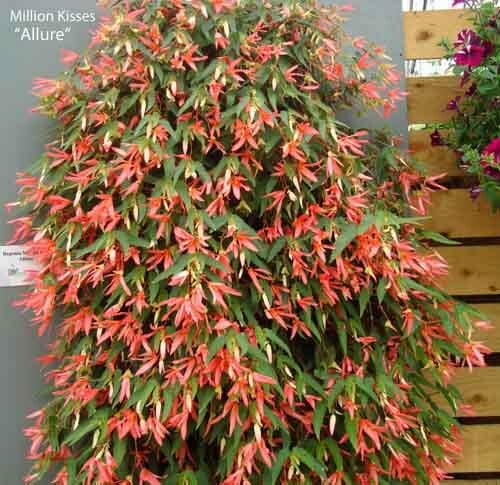 An addition to the Million Kisses series is Amour" different to the previous varieties in this range, having dark foliage with reddish flowers. Although there was a limited and exclusive introduction in 2009 of "Allure" another in the Million Kisses series, it will now be available for general release this year, it has deeper pink flowers that the earlier light pink "Romance" and should be equally as popular. 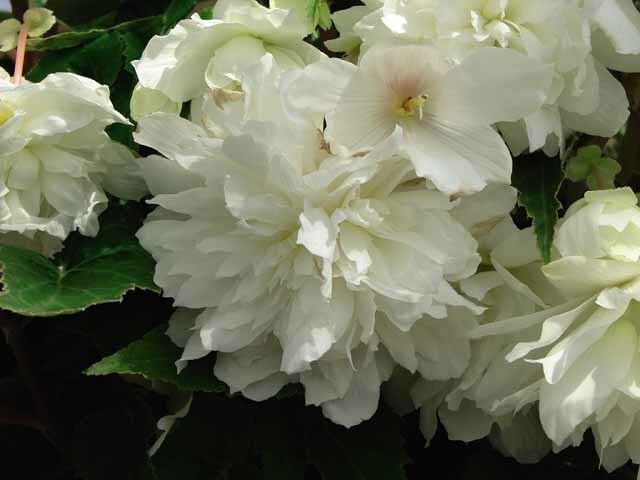 There will be limited availability of my variety “Buffy”, being a sibling of “Peardrop” it has the same attractive foliage although the plant height is slightly taller than “Peardrop”. Flowers freely and is a similar size to "Peardrop" should prove very useful for containers, it also makes a good plant for bedding purposes, the creamy buff flowers become flushed with pink when planted in an open position. Both Million Kisses "Amour", and "Buffy" are available from Mr Fothergills, more details on their web site shown below. 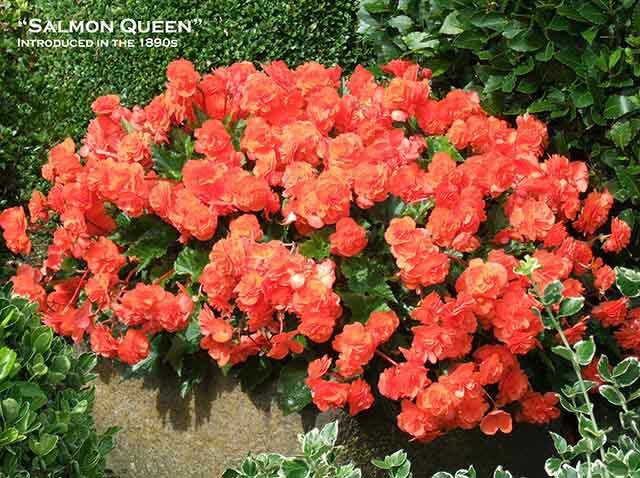 "Salmon Queen" is not new as it was originally grown in the early 1890s, it is now being revived and with limited commercial production this year it is likely to be seen in a number of Garden Centers in 2010. Salmon pink flowers just cover the plant as can be seen in the picture, and like most of the foregoing varieties can be of value grown in all the usual situations, containers, bedding and baskets. 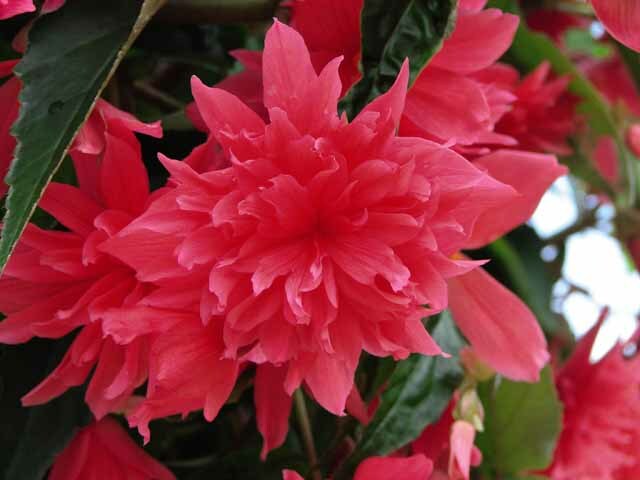 It will be available in a number of garden centers during the season. When I was over in Germany last July I was impressed with a basket variety which is due for introduction on the continent this year. 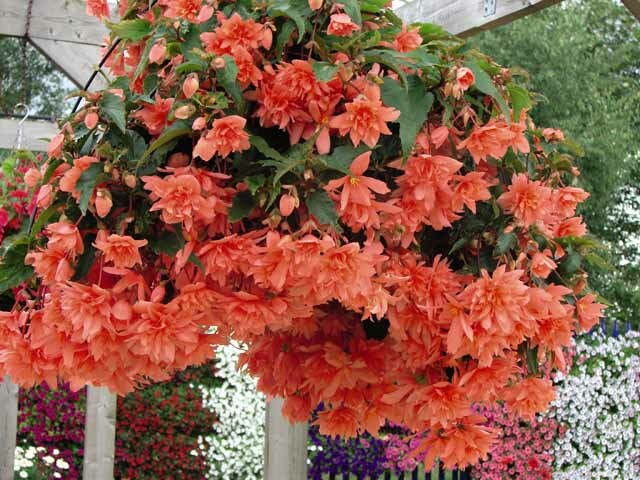 The growths hang straight down from containers and baskets where it is being grown, the medium sized double orange flowers are freely produced. It is named "Elserta" the foliage appears to have a similarity to B; boliviensis as does the flower color. 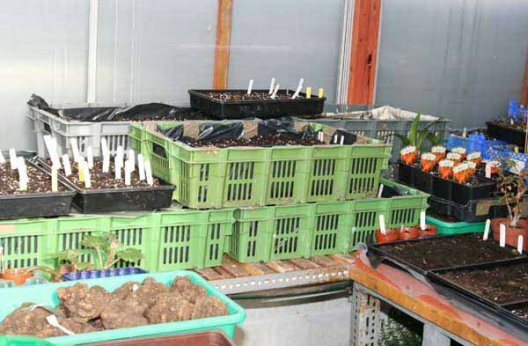 It is likely some plants could possibly arrive in the UK during the season. Unfortunately no picture is available. Other new introductions for this season is a new basket cutting produced group called "Superstars" which is stronger than "Illuminations" and with slightly stiffer growth does in my view show off the double multi-layered flowers better. 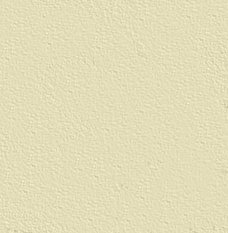 It is available in 5 colors more details available on Suttons Seeds web site (Address below) the 4 illustrated are Orange, White, Red, and Pink, there is also a light Apricot. From the pictures the variety appears to be free blooming and should give a very bright colorful display. The new compact fragrant seed raised variety "Parisienne" is available in mixed pastel colors. A similar habit to the Non Stops would make it suitable for bedding or container use, although pot or containers planted closer to nose level would enable you to appreciate their fragrance without getting a crick in your back. Also available from Sutton's Seeds. Image of this variety can be seen on Sutton's web site. A number of other mail order retailers are also listing these. Varieties from other sources similar to the Million Kisses series will also be amongst new varieties this season, but as many of them are so similar I feel there is no point in listing them all. I know other companies also have plans to send out further new varieties, so there should be much to search out online and in Garden Centers this spring and early summer.